The 2600 Mini-Press is the ideal solution for label printers looking to move to digital printing. With High quality 1600 x 1600 dpi you can produce short run promotional labels on demand. An integrated touch screen display makes label selection and printing easy. The 2600 is designed as a solution for label producers who need additional capacity for medium length runs. 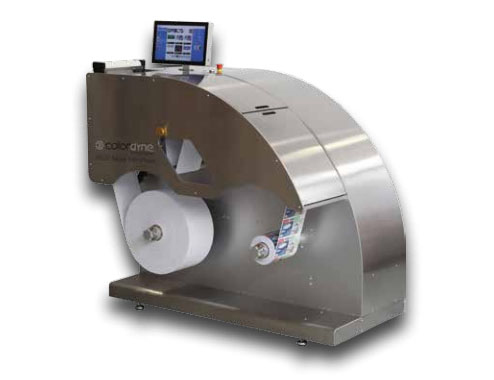 The Colordyne 2600 Series Mini Press is a mid range roll-to-roll printing platform, capable of printing high resolution full color labels and packaging. Utilizing a single Memjet® print head, paired with a self-predictive print head maintenance formula, the user can produce jobs with ease. The 2600 Series is capable of printing at speeds of 60 ft/min (18 m/min) and resolutions up to 1600 x 1600 dpi.Easy to operate, the 2600 Series features an on press job library allowing the operator to quickly navigate, sort and select which files need to be printed – eliminating the need to repeatedly resend files to the printer.Seamlessly merge designs and layouts with text, images, barcodes and database information to handle the needs of security packaging, tracking, personalization and micro-segmentation.